"This recipe is great for cut out cookies. It was given to me by one of my best friends. Everybody loves these cookies." In a medium bowl, cream together the shortening and sugar. Beat in the eggs, one at a time, then stir in the vanilla and milk. Combine the flour , baking powder and salt, stir into the wet mixture. Cover and chill for about 1 hour. Preheat oven to 350 degrees F (175 degrees C). Line baking sheets with parchment paper. 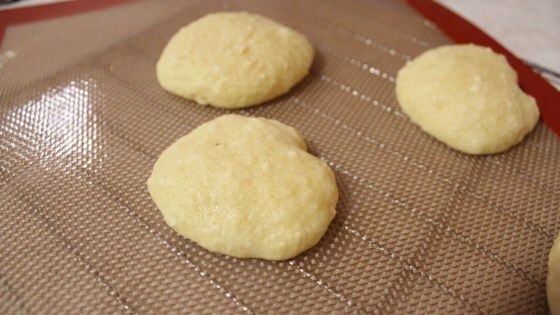 On a lightly floured surface, roll dough out to 1/4 to 1/8 inch thickness. Cut into desired shapes with cookie cutters. Bake for 8 to 10 minutes in the preheated oven, until middle of cookie springs back when touched. Cool on wire racks. Frost with frosting if desired. Excellent recipe! Easy to make, and very delicious. Frosting is a must though! Will probably use this for every holiday! these are the best cookies..you would think they have butter in them but they don't! everyone loves them! Did the trick but I wouldn't make them again. Kind of hard to work with and not much flavor.